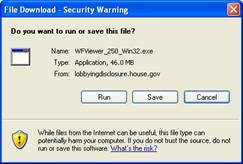 The IBM Workplace Viewer software is required to work with Lobbying Disclosure forms. Once it is installed on your computer it is available from the Start menu. You can download and install the application from the Lobbying Disclosure website. Note: You might experience a pause while the installation is registered. Note: If you click the save button, you will be prompted for a location. When the download is complete, you will need to navigate to that location and “run” the installation. • Click the Finish button to close this window. The IBM Workplace Viewer is now installed on your computer.